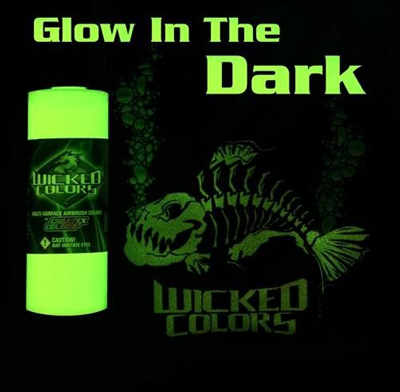 Wicked Transparent Glow Base is for application over colours to create glow-in-the-dark effects. Allow the colours to absorb direct light for 2 – 4 hours then use soon after in the dark for a soft glow, the hue being created by the colour underlying Wicked Transparent Glow Dark. The glow lasts approximately 30 minutes to 1 hour. It is best applied over bright, vivid colours such as Wicked Fluorescent Colours and Wicked White. Wicked Colours™ is an ultra-high performance, multi-surface airbrush paint suitable for any substrate from fabric to automotive applications. Wicked Colours are perfect for t-shirts, automotive graphics, illustration and almost any application. Wicked contains mild amounts of solvent inter-mixed with a durable, exterior-grade resin and automotive pigments for an extremely durable paint that withstands direct, prolonged exposure to outdoors elements without washing or fading. Wicked Colours™ have exceptional flow and atomization right out of the bottle with most airbrush tip-sizes, including 0.2mm detail tips. Wicked Colours may be reduced with W100 Reducer or 4012 High Performance Reducer Flash in any ratio for improved flow, atomization and customizing viscosity preferences. Mix with 4030 Intercoat at 10 – 25% per volume. All Wicked Colours™ are made with the same highly durable binder. Wicked Colours are sheered to a binder size of 0.5 microns and dry semi-gloss level of 70+ degrees. Wicked Detail Colours are sheered to a particle size of 0.1 microns and dry to a flat finish of 30+ degrees, perfect for illustrators as a flat finish reflects the colour’s true hue. The refined particle size of the binder allows for ultra-fine atomisation at extremely low PSI settings without over-spray or noticeable tip dry. Self-levelling while drying to a flat, even finish without the "orange peel" look. For automotive refinishing, a durable, catalyzed urethane clear is recommended. Wicked Colours cure to a strong film with air-drying alone. Heat may be used to further assist curing and is recommended for t-shirts and fabrics intended for use with multiple washings. Heat is not required for automotive, illustration and most other applications. For more application information, visit Createx Colors™ website’s technical pages. Larger sizes of 8oz (240ml), 16oz (480ml) and 32oz (960ml) Createx Wicked Colours™ are available by special order if you contact us.